Here you can download the TextDynamic7 Demo. It includes dotNET and ActiveX support and works for 45 days. The TextDynamic demo contains an interface DLL for .NET 4.x and an ActiveX for VB6 and similar. (The full version contains the source for the interface DLL so you can compile it against other frameworks). It also contains a demo project which loads the TextDynamic engine and allow the change of some of the properties. Also included is the GUI editor which is used to change the layout of the toolbar and the button images. Uninstall: Access the Windows Control Panel from the Windows start menu. Click Programs and Features and select “WPCubed TextDynamic ** DEMO” from the program list. Then click Uninstall. The software will now automatically be removed from your computer. The TextDynamic demo contains a interface DLL for .NET 4.x and an ActiveX for VB6 and similar. (The full version contains the source for the interface DLL so you can compile it against other frameworks). It also contains a demo project which loads the TextDynamic engine and allow the change of some of the properties. Also included is the GUI editor which is used to change the layout of the toolbar and the button images. The TextDynamic demo will work for 45 days. 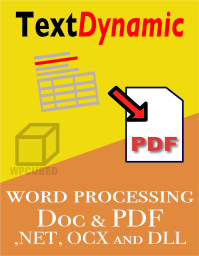 This is the HTML Version of the combined Manual and Reference for TextDynamic and wRTF2PDF / TextDynamic Server which is provided as PDF and CMH file.